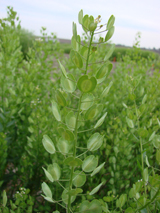 Pennycress is a common plant throughout the Midwest and is a member of the mustard family. Pennycress can be both a winter or summer annual. Plants that are winter annuals form a rosette of leaves up to 6" across. Summer annuals and 2nd-year winter annuals develop a central stem and several side stems. The central stem and upper side stems terminate in erect racemes of small white flowers. Flowers are self-pollinated, but are visited by small flies and bees (Best and McIntyre, 1975). There is no noticeable floral scent, although the foliage has a distinctive mustard-garlic aroma. Each flower is replaced by a heart-shaped, flat seedpod carrying an average of 14 small oilseeds. Each dark brown seed is oval-shaped, but well-rounded on one end and tapering to a point on the other. 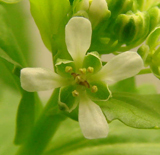 Pennycress is half the size of a canola seed with a 1000 seed weight of 0.83 grams. Wild stands can approach 1,500 - 2,000 pounds of seed per acre. The pennycress root system consists of a taproot and prefers full sun, mesic levels of moisture, and a fertile loam or clay-loam soil. Pennycress habitats include: cropland, fallow fields, areas along roadsides and railroads, gardens and nursery plots, weedy meadows, and waste areas. This plant prefers disturbed areas, and its capacity to invade higher quality natural habitats is low (Hilty, 2009).